In today’s highly competitive and demanding travel market, it has become imperative to offer customers a secured and convenient hotel booking system that’s tailored to their specific needs. 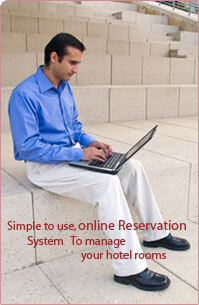 Conceptualized with the growing needs of travelers across the globe, interested to travel to India, an interactive, on-line hotel reservation system, Reserveonline.in offers 24*7 online access to a comprehensive range of hotel reservations and facilitates secure online hotel bookings on behalf of hundreds of hotels and accommodation providers. Developed with the latest technologies against a background of over 10 years in web and software development, Reserveonline.in offers an easy to use navigation and data security to make you feel at ease and comfortable. By offering travelers, a wide array of choices covering destinations across the country, we help them pick the hotel of their choice, ranging from budget to luxury hotels and serviced apartments, in line with their budget. By providing detailed information on discount hotel rooms and other travel products in India, Reserveonline.in gives the user precise informationon hotel rooms, amenities and facilities, rates and available discounts. With Reserveonline.in, a traveler can not only make direct reservations with immediate confirmation and at continually-updated prices, but also be assured of secured hotel rooms of their choice without hassles. By staying continually updated through constant communication with a wide range of accommodation providers in the market, Reserveonline.in gives travelers access to the best of accommodation providers in India. Reserveonline.in to extend their reach to travelers across the world, by staying registered with us and ensuring their presence in our database. With our hotel industry credentials combined with our expertise in web and software development, your hotel booking system will remain in safe hands! Staying focused on our patrons needs; Reserveonline.in helps them to ensure their needs 24 hours a day. Reserveonline.in welcomes suggestions from interested parties to make the website more engaging and beneficial to their requirements. It’s Robust and secure and facilitates agents/travelers to reserve hotel rooms online from anywhere in the globe. Its a. simple, easy to use system designed to boost your direct sales. It offers comprehensive and detailed product information to agents/travelers. It allows travelers to check the availability of rooms on accommodation properties, 24 hours, 365 days a year. It provides instant confirmation regarding status of the booking over email/phone. It offers multiple payment options. It offers Last Minute Booking Options. It keeps track of customer’s visits and generates sales and check-in reports.